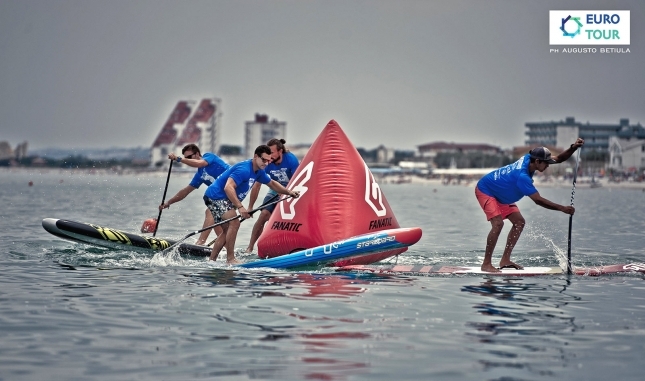 In brief: Leo Nika and Susak Molinero have saluted in Week 12 of the EuroTour, claiming the Adriatic Crown in Marrotta, Italy to cement their respective statuses as the winningest athletes of this year’s European summer. The win was Leo’s fourth-straight of the Tour, and fifth in total after he won the opening round way back in early May. It was also a fourth-straight spot on top of the podium for Susak, who paddles for the RRD team, edging her ahead of three-time EuroTour event winner Sonni Hönscheid (who locked up the EuroTour championship title earlier in the summer and hasn’t raced since). While Leo still has Connor, Boothy and Titou ahead of him on the updated EuroTour Leaderboard, the Italian has proven himself this summer to be one of the real stars of Europe. The Starboard team rider will now prepare for a trip to the States, where he’ll compete at the big showdowns in Huntington (Jamie Mitchell’s Survivor Race) and Oregon (Gorge Paddle Challenge), before gearing up for the Red Bull Heavy Water invitational in San Francisco, the World Series stop in San Diego, and the 6-star Pacific Paddle Games in Dana Point. Those five huge events will be a great test to see where Leo — who has been ranked top 15 for a long time but hasn’t been able to compete in the States over the past few seasons — rates against the rest of the world’s best. Though judging by his performances this summer, I daresay he’ll be right up there at the pointy end of the field. The Italians in general have really proven themselves to be a force on the EuroTour this summer, with six of the ten “most traveled” men on the leaderboard all hailing from Italy. On the women’s side, Susak, who has shown fantastic form the past couple of months, is officially from Spain but lives in Italy with her boyfriend and fellow top European, Paolo Marconi. Others to impress at Marotta this weekend were runners-up Jeremy Teulade and Amandine Chazot, along with the other top five guys Giordano Capparella, Boris Jinvresse and Martino Rogai, all of which are rising prospects on the European scene. Full coverage, results and media from the Adriatic Crown can be found over on the official EuroTour Facebook. Plenty more pics over on Dropbox. The 2016 EuroTour presented by Starboard is now officially complete. The final two stops, in the Azores Islands and St. Ives, England, were put on hold this year, which means the marathon will finish with a dozen events.